It’a Halloween month! I considered several options for this, a la Linkara. Would I look at the first 4 Halloween novelizations? There’s enough Michael Myers this month. Buffy? Considered strongly but there’s a lot of material and not enough time to curate it. Random novelizations? You deserve a theme month. And so it is we’re doing one. My all-time favorite TV show The X-Files is 25 years old this fall and in celebration, I’m looking at all six of the adult novels. Why? Because it gives me a chance to explain in full detail what the show means to me. 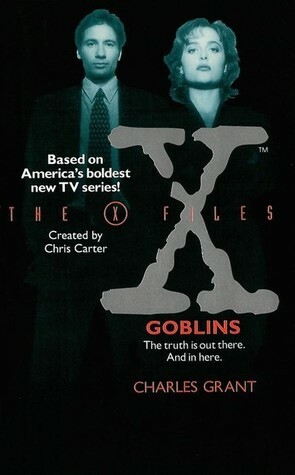 When The X-Files: Goblins was published in October 1994, the show had been on the air for all of one year. Given the lead time needed for even the most rushed paperbacks, that puts at most writer Charles Grant getting to see the first season and more likely than not only having seen a few episodes and being told where the show would be at the start of season 2, given a vague reference to the events of the premiere. That makes this book a very, very early piece of work for the series. We’re so early many of the show’s trademarks weren’t remotely set. And wow is that clear as you read this book. The book focuses on a string of murders seemingly caused by an invisible killer though the trail quickly leads to a government experiment to create chameleon soldiers. It’s a fairly standard plot for the series. It could’ve happened in season one or season nine, it’s that reliable. That’s not the interesting part of this book. What makes this book a notable read for fans is how perfectly it captures the embryonic version of the show. This isn’t the Mulder and Scully we’ll come to know in the future. This is a very raw version without many of the show’s trademarks. What we have is a Mulder with a social life. He’s shown to have friends. He’s well liked by others, respected in the FBI for his gift. He even flirts with a woman he’s dated before. He’s not the witty, highly antisocial leading man we came to know. Similarly Scully, or Dana as she’s usually called, is a bitter, distant figure. There are very few scenes of her alone. She’s unlikable and cold, not the wry figure who eventually forms. Oh and Mulder and Scully, the ultimate OTP? They’re very clearly coworkers with no connection at all. And that makes sense when you consider how little of the show Grant was working with to write this. While the pilot set things perfectly, the first season is weird. It wasn’t yet clear aliens were really a mythology only thing so you got a lot of alien episodes. The characters were far from established too. It’s not implausible that at the end of the season, Mulder is still Agent Mulder to Scully. So yeah, this is the show in that moment. But it’s still weird as hell to read. It doesn’t help that Grant can’t keep focused on the characters in favor of his own creations. He builds up everybody in the town where the murders happen. Maybe not the most vibrant characters but you still get a feeling of who everyone is. It’s clear compensation for having no idea what he was adapting. This is something you can look for in virtually every first novel for a show. It’s as awful here as it always is. The book isn’t all that satisfying as a mystery either. The idea that it might be a “goblin” is flirted with only sparingly in favor of an obvious conspiracy. The actual killer is a minor character not interesting enough to be a suspect in the first place. It’s a very dull case. The one good thing this book has is atmosphere. I could vividly picture what I read. Not shocking given that Grant was a legend in the paperback pulp horror world. Paperbacks From Hell devotes a lengthy amount of the book to Grant. He knew what he was doing. Ultimately this isn’t a good book. It’s only interesting as an artifact, a rushed cash-in on a growing pop culture phenomenon. This was the early days of The X-Files. Grant only had a bit longer to write his next book. Wednesday we’ll see if that made a difference.